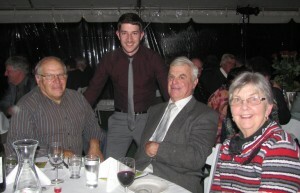 Our Landcare Facilitator, Anthony Gallacher was runner up finalist in the Loddon Powercor Excellence Awards in the category of Employee of the Year, held on the 30th of May, 2013 in Eddington. The dinner was a great social opportunity for the LPLN, which was well represented with two tables at the event. The awards celebration was held at the Eddington Hall and included pre-dinner drinks and canapés, plus a 3 course meal. Musician Mike Brady entertained the crowd and Neil Druce, owner of the Junee Licorice and Chocolate Factory, provided an insightful and engaging story as guest speaker. Congratulations to all the winners for the evening. Well done to Anthony and the LPLN for making the finals. Thanks to the Loddon Shire, Powercor and other sponsors for putting on a great event. Photo at the Awards (from left): Fred Belli, Anthony Gallacher, Bill Twigg and Gwen Twigg. Photo courtesy East Loddon Community News.